Citric acid, natural & artificial flavors, malic acid, silicon dioxide, sucralose, soy lecithin. Mix 1 serving (2 level scoops) in 20 ounces of water and shake vigorously for 30 seconds. Sip throughout workout, athletic event or any time additional aminos are needed. Contains soy lecithin. Produced in a facility that may also process dairy, eggs, fish, shellfish, tree nuts, peanuts, wheat or soy. This product is only intended to be consumed by healthy adults 18 years of age or older. Pregnant or nursing women should not use this product. Discontinue use and immediately consult your health care professional if you experience any adverse reaction to this product. Do not exceed recommended serving. KEEP OUT OF REACH OF CHILDREN. Citric Acid, Natural & Artificial Flavors, Sucralose, Silicon Dioxide. Mix 1 serving (2 level scoops) in 20 ounces of water and shake vigorously for 30 seconds. Sip throughout workout or athletic event. Citric acid, natural flavors, sucralose, silicon dioxide. Citric acid, natural & artificial flavors, malic acid, sucralose, silicon dioxide, soy lecithin. Mix 1 serving (2 level scoops) in 20 ounces of flavored beverage of choice and shake vigorously for 30 seconds. Sip throughout workout or athletic event. Using less than 10 ounces of liquid per scoop and/or very cold liquid can hinder solubility and cause foaming. Due to high leucine content some initial foaming may occur, which should subside over a few minutes time with light shaking. Mix 1 serving (2 level scoops) in 20 ounces of water and shake vigorously for 30 seconds. Sip throughout workout or athletic event or any time additional aminos are needed. Microcrystalline Cellulose, Calcium Carbonate, Croscarmellose Sodium, Hydroxypropyl Cellulose, Hydroxypropyl Methylcellulose USP, Stearic Acid, Magnesium Stearate, Silicon Dioxide, Glycerin. Take 5 tablets between meals. USPLabs Answered the Call with Modern BCAA+! Mike, CJ, and Kevin tried and reviewed Modern BCAA+ (limited edition pink lemonade flavor) on a super hot day and came away crazy impressed. It all goes better once CJ figured out the right amount of water for his liking. We've also had grape bubblegum, which definitely lives up to its name is and our favorite grape flavor we've had yet. See That? No BCAA Floaties! We've all heard that one, but this time it's for real. When cutting, it's great to sip on BCAAs all day - and with this product, you'll WANT to! Grape Bubblegum has been a killer hit with Jack3d fans, and this flavoring is slightly purple colored but mixes clean. White Blue Raspberry mixes clear - adding blue coloring is not necessary! 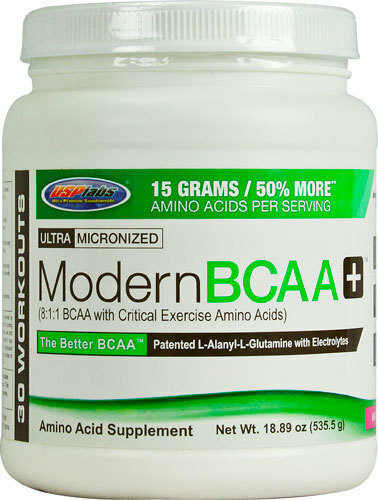 There is also an unflavored version of Modern BCAA. 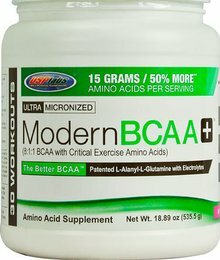 Modern BCAA+ is an Incredible Deal! Look at the calculations on grams of total amino acids per dollar - this is a BETTER product that has LOWER prices than its competitors (and even more aminos for your dollar than the old formula)! It's a win-win!